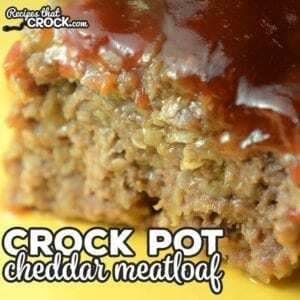 Slow Cooker Cheddar Meatloaf - Recipes That Crock! 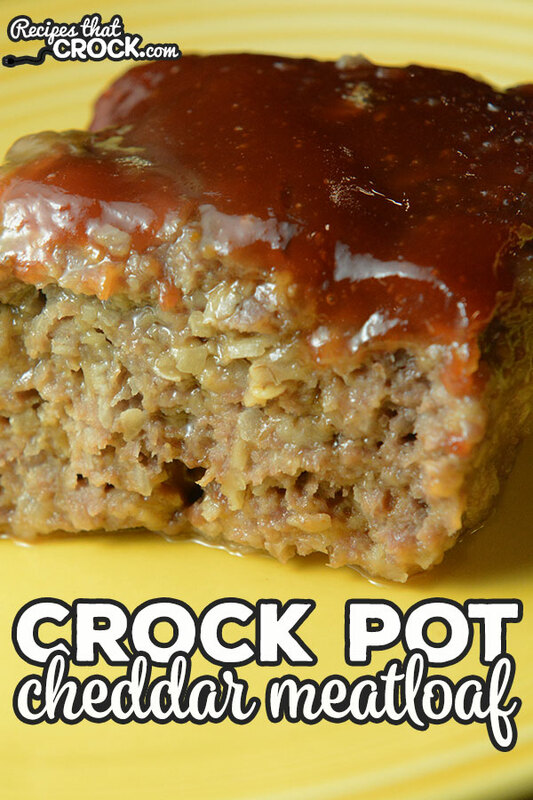 Do you love meatloaf and want a quick and easy crock pot recipe? This Slow Cooker Cheddar Meatloaf is a delicious twist on your favorite meatloaf recipe! I was flipping through my new Gooseberry Patch Foolproof Family Recipes and ran across the Mini Cheddar Meatloaves recipe. It looked really yummy, but as usual, I wanted to do things my way. (I am a youngest child ya know! 😉 ) So I just made a regular sized loaf and threw it in my slow cooker. I also switched up an ingredient or two to fit my taste…and it worked perfectly. Oh. My. Yum. This was just amazing. Ryder kept asking for more and more…as did his Daddy! We paired it with these Crock Pot Creamy Mashed Potatoes which makes about 10-12 servings. I suggested we try freezing part of the potatoes. 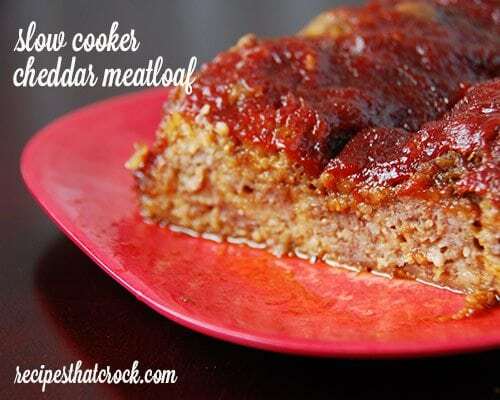 Michael said I just needed to make this Slow Cooker Cheddar Meatloaf again. This recipe is so good that he wanted to eat it ALL WEEK LONG! And on top of the wonderful flavor, it was super easy to throw together, and I didn’t have to buy anything to whip it up. That is always a bonus in my book! Lightly grease your slow cooker. Place your milk, egg and salt in a large bowl. Whisk until completely blended. Add your cheese, quick-cooking oats, dried onions and ground beef to the egg mixture. Mix all of these ingredients together until well blended. Place in slow cooker and form into a loaf. In a separate bowl, mix together your ketchup and brown sugar. Pour this over the top of your meatloaf. Cover and cook on low for 4-6 hours or on high for 2-3 hours. Make sure the internal temperature is at least 160 degrees before serving. (We recommend this great non-stick slow cooker for this recipe OR this one with a built in meat thermometer!) 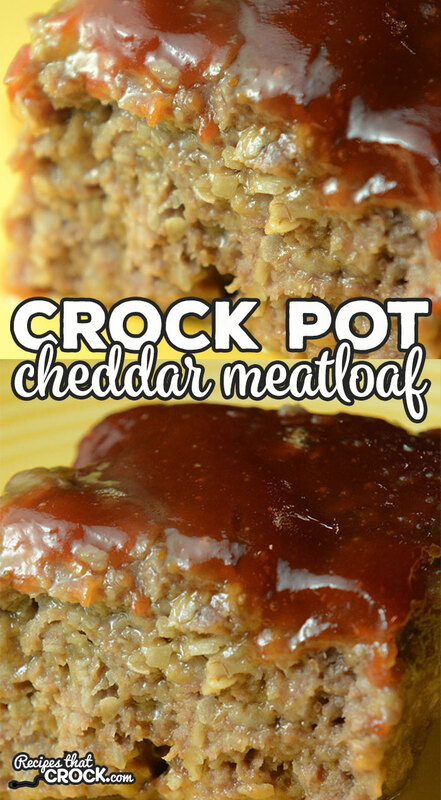 If you want to be all fancy, carefully lift this pretty little meatloaf out of your slow cooker and place on a serving plate. This recipe is an adaptation from one found in Gooseberry Patch’s Foolproof Family Recipes. You can use any 6 quart slow cooker to make this recipe. Check out our favorite Cookbooks, Slow Cookers, Pressure Cookers, Multi-Cookers and Air Fryers in our Amazon Influencer Shop. Lightly grease your slow cooker. Place your milk, egg and salt in a large bowl. Add your cheese, quick-cooking oats, dried onions and ground beef to the egg mixture. Mix all of these ingredients together until well blended. Place in slow cooker and form into a loaf. In a separate bowl, mix together your ketchup and brown sugar. Pour this over the top of your meatloaf. Cover and cook on low for 4-6 hours or on high for 2-3 hours. Make sure the internal temperature is at least 160 degrees before serving. This recipe is an adaptation from one found in Gooseberry Patch's Foolproof Family Recipes. I used the leftovers to make sandwiches. A thin slice of meatloaf, heated up with extra cheddar, topped with a fried egg on whole wheat. It was so delicious that I think I’ll double the recipe next time so we have more leftovers! That sounds delicious! And I agree, the more of this meatloaf the better! We were actually sad to not have more leftovers. Glad you enjoyed it too! What size crockpot did you use for this? Thx! I used my 6 quart slow cooker. Enjoy! Minced onion or like French fried onion? Thank you! Thanks so much for your feedback! We loved this recipe too! We are a GF family, could I substitute bread crumbs for the quick cooking oats? I have GF oats, but they aren’t quick cooking…thanks! My family doesn’t cook GF, so I am not familiar with options for substitutions. If you give it a try, let me know how it turns out! My husband is not crazy with ketchup or sauces on top of his meatloaf. Would this recipe still work in the crock pot with it? Thanks. Personally, we love the sauce, so I’ve never tried it without the sauce. It is worth a shot trying it without it. Let me know how it turns out! Is it really 1/2 cup of dried onions?? Like dried chopped or minced onions? That seems like an awful lot of dried onion to me. Michael absolutely loves onion flavoring, so this worked well for us. With all the flavors in this recipe the onion flavor not overwhelming at all, but if you are leary, feel free to reduce the measurement down! Enjoy! thanks. I think I’ll trust you and go with the 1/2 cup. We love onion too so I’ll give it a try. It just sounded like a lot.